Air Conditioning can be a vital to your business. In the event of a break down or fault, it can seriously alter the temperature of your shop floor, restaurant or work place. 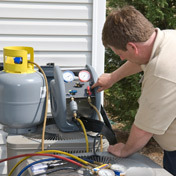 ACS offer service and repair to air conditioning units should the worst happen. In addition we offer maintenance contracts to ensure the smooth running of your installation regardless as to who installed the equipment.